Home › Home and Kitchen › [Update Version]Ilyever 18/8 Stainless Steel Ice Cream Scoop3 Piece Professio..
[Update Version]Ilyever 18/8 Stainless Steel Ice Cream Scoop3 Piece Professio..
[Update Version]Ilyever 18/8 Stainless Steel Ice Cream Scoop,3 Piece Professional Cookie Dough Melon Scoop, Best Metal,Super Grip and Stylish Design - Rock Your Kitchen with Your New Super Scoop! NOTE THAT OTHER SELLER SELL FAKE PRODUCT,PLS PURCHASE ICE CREAM SCOOP FROM ILYEVER .BEST QUALITY - 18/8 stainless steel ,the best material for kitchenware known for providing long lasting usage. Made from premium food grade stainless steel, these superior scoops contain no harmful chemicals or toxins to leach into your food safety, strength, and durability.Our Ilyever Stainless-Steel ice cream scoop Set can be used by professional cooks and home chefs who value quality kitchen tools. 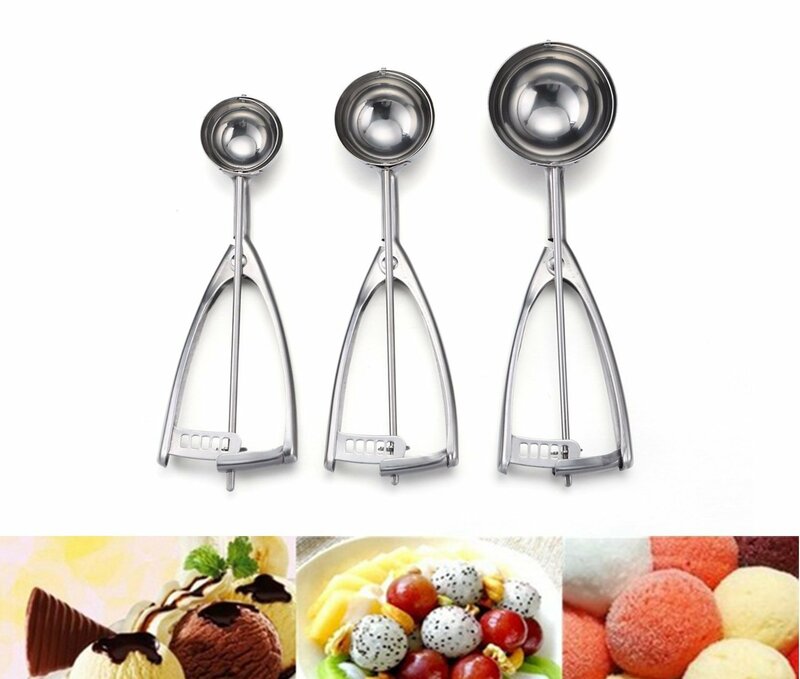 SCOOPING HAS NEVER BEEN SO SIMPLE - YOU DISHER TASTE LIKE THOSE IN THE BEST DESSERT SHOP!-Ilyever Stainless-Steel Cookie Scoop Set includes 3 different sizes,Capacity and Length :Small 1.5" Ball/ 21.5cm, Medium 2" Ball/22.5cm,Large 2.5"Ball/23.5cm.You can easily create beautifully different rounded balls of icecream,melon balls,sorbet, fruit, frozen yogurt,perfectly portioned cookies, cupcakes, pancakes and many more healthy meals. EASY TO USE-the innovative cog and ratchet scoop with release system (no springs or triggers!) our scoops reduce pressure on your wrist and hand.our perfectly sized scoop glides easily and does not require intense effort or tireless hand strength. Scoop after scoop, working through a large bowl of cookie dough is a breeze and fast. Thoughtfully designed with identical squeezy handles, this ergonomic scoop fits comfortably in the left or right hand. 100% RISK-FREE LIFETIME GUARANTEE-Our Ilyever scooper are made from superior stainless steel that is lead-free and will not rust, bend, or deform. It's so sturdy that you can scoop frozen ice cream . And if you unsatisfied with the quality of our product, we offer you 100% risk-free satisfaction guarantee to let you buy with confidence. So, why think twice? ORDER NOW to get this incredible scoop set. EASY TO CLEAN,DISH WASHER SAFE.